We’re On Our Way to #JaxCon! We’re starting off 2016 with a bang! On January 16th and 17th, Random Acts staffers Sara and Jessica will be in attendance in the vendors room of Creation Entertainment’s Official Supernatural Convention in Jacksonville, Florida (#JaxCon)… and we’d love to see you there! 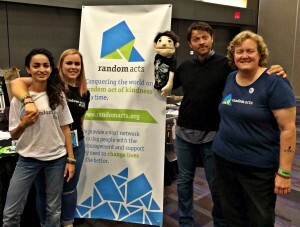 By now, our dedicated supporters know the drill, but for anyone who’s new to the convention circuit, here’s how this goes: At any convention, Random Acts makes it a priority to partner with a local nonprofit and hosts a flurry of activities to benefit the community in whatever way possible. This time around, we’ve paired up with PACE Center for Girls Jacksonville to put together one very special project. PACE Center for Girls Jacksonville works to offer girls and young women opportunities for a better future through education initiatives, counseling services, training programs, and advocacy work. Founded in 1985 in Jacksonville, PACE Center for Girls Jacksonville serves over 2,000 girls each year and has changed the life trajectory of over 37,000 girls since its inception. What started as a community response to the realization that girls involved with the justice system were being placed in programs meant for young men has, over the years, evolved to become a national model for reducing recidivism and improving school success, employment and self-sufficiency. You can find out more about PACE Center for Girls Jacksonville’s work over on the group’s official website here. For more information about JaxCon itself, make sure to visit Creation’s official convention page here. Don’t forget to follow along on all our social media channels throughout the weekend to get updates on contests and drawings too! We can’t wait to see you there! Let’s get ready to have a good time and #GetKind!